Vor 5 Jahren startete die BlackICE BBS als "Experiment". Wie es dazu kam und mehr Hintergrundinformationen gibt es im Video 5 Jahre BlackICE BBS. Das Video findet Ihr im Menue unter Videos. cleaning and rebuilding the system some slight changes where made. The old 80:774/0 should not be used anymore. The Sysop also let us know, that all passwords have to be in CAPITAL LETTERS now. If you are part of the RetroNet please make sure to update your settings. In einer E-Mail kuendigte der DynDNS-Dienst dtdns.com an, seinen Dienst zum 01.August einzustellen. Diese Ankuendigung kommt vermutlich sehr kurufristig. Denn unklar ist bisher ob der 01.August 2018 oder 2019 gemeint ist. In der E-Mail die an alle bisherigen Teilnehmer der DNS-Dienste von dtdns.com versendet wurde wird das Jahr 2018 genannt. Auf der Startseite von dtdns.com ist jedoch das Jahr 2019 als Deadline angegeben. Zu welchem Zeitpunkt genau viele Mailboxen deshalb nicht mehr erreichbar sein werden ist bisher unklar. *update* Inzwischen spricht auch die Webseite vom Ende zum 01.August 2018. Viele Mailboxen benutzen dtdns als ihren Dynamischen DNS Service. Die meisten Systeme stehen, wie es sich gehoert, unter oder neben dem Schreibtisch des Sysops. Da sich jedoch in der Regel alle 24 Stunden die IP-Adresse einens privaten Internetanschlusses aendert wuessten die User nicht mehr wie die Box erreichbar ist. Deshalb nutzt man einen DynDNS-Service. Dieser stellt eine Domain zur verfuegung. Nehmen wir als Beispiel bbsindex.com oder darktechn.org wie sie von dtdns angeboten wird. Als Nutzer des Service kann ich nun eine SubDomain erstellen: BlackICE.bbsindex.com. Nachdem fuer diese SubDomain eine IP-Adresse hinterlegt wurde, werden alle anfragen die auf BlackICE.bbsindex.com eingehen vom DynDNS-Anbieter auf die IP-Adresse weitergeleitet. Mehrere Schnittstellen erlauben es dem Sysop z.B. per Script die IP-Adresse immer aktuell zu halten. Somit ist eine Mailbox immer unter der gleichen Adresse erreichbar. Im Fall von dtdns duerften einige Mailboxen ins rotieren geraten. Die Deadline ist knapp, sollte sich 2018 bestaetigen, um allen Usern die neue Adresse zu geben. BBSindex.de und die BlackICE BBS mit dem BBSnet wird hier helfen. Wir werden eine Umzugliste am Ende dieses Beitrages fuehren. Jeder SysOp oder auch User der von einem bestehenden Umzug informationen hat, kann sich an BBSindex.de wenden via Twitter: @BlackICEbbs oder in der BlackICE BBS selbst, dem Sysop eine Nachricht schreiben. Auch eine News einreichen auf BBSindex.de funktioniert. Die ersten zwei Mailboxen von denen wir Wissen die nun Umziehen muessen sind die BlackICE BBS und die Wintermute BBS. Wir versuchen den tatsaechlichen Termin derzeit zu ermitteln, wann dtdns genau seinen Dienst einstellt. Alternativen sollte man sich bereits einmal ansehen. goip und ddnss sind zwei die einen Blick wert sind. 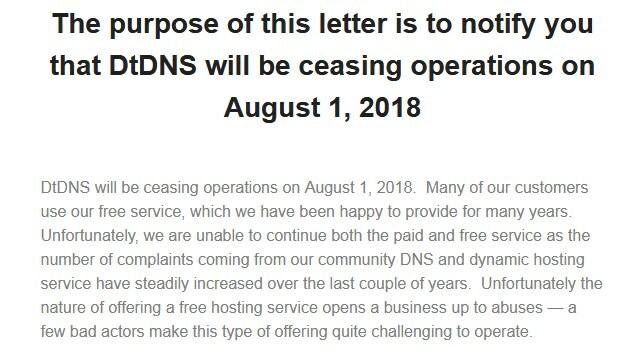 Via e-mail, the DynDNS service dtdns.com announced to cease operations by the first of August. This announcement seems to come at short notice. As of now, it is not clear whether the shutdown is planned for August 01, 2018 or 2019. While their e-mail mentions 2018, the webpage dtdns.com states 2019. At which point several BBS systems will become inaccessible due to this announcement is not clear yet. *update* just a few days befor the Deadline shows up: DtDNS changes the Post on it's Webpage. Now the Deadline matches the E-Mail. The End is set for August 01, 2018. Many BBS systems use DtDNS as their dynamic DNS service. Most systems are, as is right and proper, located close to the operator's desk. However, since the IP address of a private internet connection usually changes every 24 hours, many users wouldn't know how to connect to this box. That's why a DynDNS service is used: It provides a domain name. For example, take bbsindex.com or darktechn.org which are hosted by DtDNS. As a user of that service, I can create a sub-domain: BlackICE.bbsindex.com. After providing an IP address for this sub-domain, all requests going to BlackICE.bbsindex.com will be forwarded fo this IP address by the DynDNS provider. Multiple interface allow the operator to keep the IP address current at all times to keep the BBS system always accessible through the same address. In the DtDNS case, multiple BBS systems may get into trouble. Should 2018 prove true, there is little time to inform all users of the new address. BBSindex.de and the BlackICE BBS with the BBSnet will provide help. We will keep a moving list at the end of this message. Every operator or user knowing about this move is able to reach BBSindex.de either via Twitter: @BlackICEbbs or by sending mail to the Sysop from within the BlackICE BBS itself. It is also possible to submit a news entry on BBSindex.de. The first two boxes known to move are the BlackICE BBS and the Wintermute BBS. We will try to investigate the exact date at which DtDNS will cease operations. In any case, now is the time to check out alternatives. At least goip and ddnss seem worth looking at. Lodger, Sysop der Wintermute BBS und Webmaster von ufud.org gibt einen Einblick in sein Home Network. Realisiert hat er dies u.a. mit einem auf Raspis basierendem Docker Swarm Cluster. Wie man damit eine Homepage von Zuhause aus betreiben kann ist nur eine der Frage die in diesem Video beantwortet wird. Die BlackICE BBS war volle sieben Tage durch einen Fehler beim DynDNS-Anbieter DtDNS offline. Die Domain bbsindex.com loeste nicht auf. Mehrere versuche den Support von DtDNS zu kontaktieren verliefen ohne Antworten. Nicht nur die BlackICE BBS war betroffen sondern auch die Wintermute BBS und andere Systeme die sich ebenfalls fuer diese Domain und den Service von DtDNS entschieden haben. Immerhin gelang es dem Sysop der Wintermute eine Antwort vom Support zu erhalten. Allerdings war diese wenig aussagekräftig. Erneutes nachfragen blieb ebenfalls ohne Antworten. Die Sysops der BlackICE BBS und der Wintermute BBS gaben gestern bekannt noch 24 Stunden warten zu wollen bevor sie vollstaendig den DynDNS-Service wechseln und DtDNS den Rücken kehren. Beide Mailboxen verfügen nun über alternative Adressen. Für andere Sysops lohnt sich vermutlich ein Besuch bei spdyn.de - Der deutsche Anbieter macht einen guten Eindruck und bietet ausfuehrliche FAQs, eigenes Wiki und ein schoenes Userinterface sowie tonnenweise Schnittstellen zum updaten der IP-Adresse. Seit ca. mehr als 30 Stunden ist die BlackICE BBS offline weil der DynDNS Service (DtDNS) offline ist. Wie der Sysop der Wintermute meldete arbeitet der Support bereits an dem Problem. Alle Nodes die erreichbar sind werden weiterhin mit Nachrichten versorgt. Alle Points die nicht von der BlackICE aus erreichbar sind, muessen leider warten bis der Fehler behoben wurde bzw. ein neuer DynDNS Dienst gefunden / erstellt wurde. Sollte der Fehler weiterhin bestehen wird vor dem Wochenende noch eine Alternative gesucht und auf Twitter und hier auf BBSindex.de gepostet. Some weeks ago first tweets popping up at the Retro-Scene that someone was able to get the collection of an hackergroup. The group is called Bamiga Sector One (short BS1) and was in the 1990s a very active wide spreaded cracker group in the Amiga-Scene. I bet everyone who ownes an amiga back in the day had one or more disks in his floppycase with a game cracked by this guys. In Belgium, nowdays, a car was full packed with boxes. The content: The Collection of the BS1 Group. Almost forgotten on a attic from a former member and now thankfully recoverd by the AmigaClub Belgium. Simon is now taking action on all this stuff. We're talking here about a hugh amount of disks. What means hugh exactly? 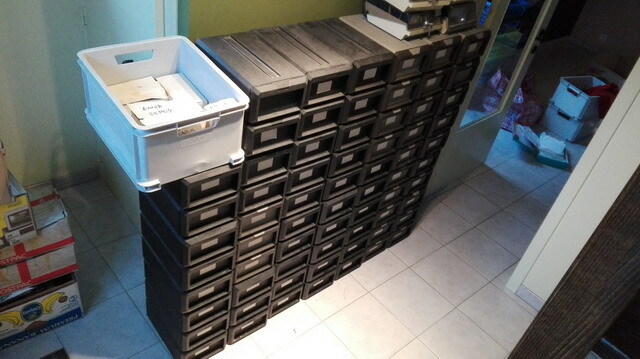 About 75 Boxes and estimated more than 10.000 Disks! What happend to all the stuff? Great to have a very sharing community in the Retro-Scene these Days (and according to the spirit of BS1 also thendays....) All the software will be ripped into .adf image files, zipped and uploaded to the AmigaClub.BE webseite. You want more RetroStyle? Here we go! 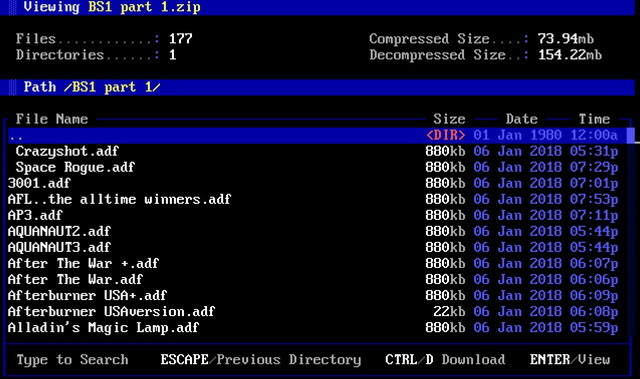 The BlackICE BBS has an extra Sub-Area inside the Amiga-Download section created. The Sysop offers the same content as the website with one exception. The Single-Title-Section. Here you can browser and download all files from the cleaned packs. But be aware! Yes it's the almost biggest collections of games ever, but it was a cracking group. If a virus hijacks your Amiga don't blame us. Stop talking! Where i can get the Stuff?! Dial the BlackICE BBS with an Terminal-Programm like SyncTERM (for IBM machines) or a similar programm for your Amiga and call BlackICE.BBSindex.com:23 via Telnet. The BBS supports ANSI for full retro-experience! You can create fast an account or have a look with one of the guest-accounts. At the File-Area you will fast found the Amiga-Section. Inside there you can enter the sub-area fresh created and filled with the first files from the BS1 collection. Keep looking for the next weeks. There are just 20% of all stuff online at the BBS and on the Website. Have a nice leech! BBSindex.de will keep you updated on this! BBSindex.de is from Friday 18:00 until Saturday Morning NOT ONLINE. For upcoming improvments on the Server is a nearby location the best deal for the future. In this timegap you can reach the website and other services like XMPP, BBS-Stats, BBS-List are will be also offline. More maintenance and offline-times are not scheduled. BBSindex.de wird ab Freitag ca. 18 Uhr bis in den frühen Samstag-morgen NICHT ONLINE SEIN. Die nähe zum Server macht Erweiterungen usw. in der Zukunft einfacher. In dieser Zeit werden weder Webseite noch andere Dienste wie XMPP, BBS-Stats, BBS-List online sein. Weitere Wartungsarbeiten mit Onlineausfällen sind aber nicht geplant. The BBSindex.de BBS-List in your BBS! There is a very small "API" for all Sysops to get the BBS-List from BBSindex.de into there boards. All you need is an url-grabber like curl.exe (windows) or wget (boarded with linux). The first command will fetch an ascii-copy WITH MYSTIC |COLOR-CODES and dump it into the file bbs-list.txt located in your \mystic\text\ folder. The 2nd command starts the build-in ansiviewer from Mystic BBS and shows the bbs-list.txt file to your users. You can use the following URL to fetch an clean ASCII BBS-List without the mystic color-codes and show this version of the BBS-List to your user. I would be thankful for instructions how to set the list up for several BBS Software like Syncronet or other ones. Please share your knowledge with other Sysops, correct my tiny-tutorial if i missed something or could do it better. The BBS-List will also spread to the Scene via the BBS-Network. Contact Vitus Zeel@2:240/8001 for more infos about the Network and how you can get the binary version with prebuild phonebooks based on the list. Should i translate this to german? Soll ich das noch auf Deutsch uebersetzten? BBSindex.de starts the new year with a big impact on the BBS-Scene. We invite all SysOps from all over the world to add your Board to our list. 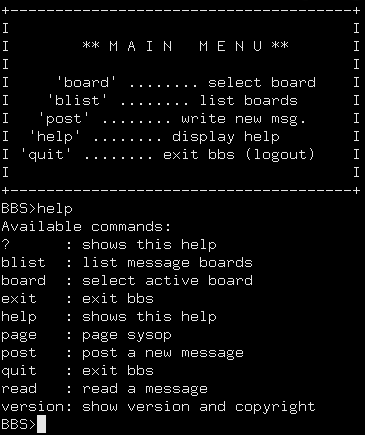 connected Boards of the BBS-Network [BBSnet]! the Echo called "BBS-Network BBS-List" for a plain text-list. You also can enjoy calling the most Boards via WebTerminal from BBSindex.de. BBSindex.de startet das neue Jahr mit einem grossen knall in der BBS-Scene. Mailboxen die mit dem BBS-Network [BBSnet] verbunden sind! haltet ausschau nach dem Echo "BBS-Network BBS-List" für die Text-Liste. aktiven Mailboxen aus der Liste anrufen! Ein Update auf bbsindex.de stellt nach dem sonst ruhigen Jahr 2017 den Jahresabschluss dar. Es gibt neue Kategorien! Darunter Videos. Hier finden sich alle Videos die unter dem Namen BlackICE BBS erschienen sind. Das aktuellste Video von BBSindex.de ist dort ebenfalls zu finden. Zukünftige Neuerscheinungen werden sich zu den bereits gelisteten dazugesellen. Die ßeta-Version des BBS-Scene und Retro-Quiz wird in Zukunft noch mehr Fragen erhalten. Drüber hinaus ist ein Scoring-Mode geplant. Einen ersten Ausblick gibt es aber bereits jetzt für Euch! Und wer selbst gerne ein paar Fragen zum Quiz verfassen möchte wird in Kürze ebenfalls gelegenheit dazu haben. Eines der grösseren Projekte für das kommenden Jahr sind die Mailbox-Statistiken. Wir haben bereits 3 Mailboxen die daran Teilnehmen. Ziel ist es die aktivitäten der Mailboxscene einordnen zu können. Aus diesem Grund melden teilnehmende Mailboxen nach einem erfolgreichen Userlogin diesen der Statistikdatenbank von BBSindex.de. Es können aber nicht nur Anrufe also Logins aufgezeichnet werden. Auch andere aktivitäten wie DoorGames oder die Menge der Nachrichten welche durch die jeweile BBS durchroutet kann erfasst werden. Im laufe der Zeit kann sich jeder einen Überblick verschaffen wie aktive die Scene noch ist. In kürze startet die offene Phase. Derzeit nehmen nur die BlackICE BBS, Kuehlbox und Wintermute am ersten Test teil. Wir hoffen auf rege Teilnahme von anderen Mailboxen aus dem deutschsprachigen Raum. Für die Zukunft werden Systeme aus allen Ländern willkommen sein. Dafür benötigen wir jedoch noch etwas Erfahrung und müssen eine Zeitzonenkompatibilität einarbeiten. Die BlackICE BBS meldete am 13. Dezember um 19:08 Uhr einen Hardwareschaden. Die Systemfestplatte des Rechners erlag einem Mechanikfehler. Eine Ersatz-Festplatte wurde bereits installiert. Zur Zeit werden Backups vom System zurückgelesen. Danach sollen Backups der BBS erfolgen. Alle Daten die auch in die Download-Area der Box bereit stehen sind vorhanden. Zwischen dem letzten Backup und dem Fehler liegen ca. 14 Stunden. Es wird, wenn überhaupt, mit einem sehr kleinen Datenverlust gerechnet. Dieser beschränkt sich dann auf Echo und Netmails. Erst einen Tag zuvor wurde eine unregelmaessig auf dem Twitter-Account der BlackICE BBS gemeldet. Ob dies erste Anzeichen für den Hardwareausfall waren ist bisher noch nicht geklärt. Genaue angaben wann die BlackICE BBS wieder online geht gibt es bisher nicht. BBSinndex.de und Twitter.com/BlackICEbbs wird weiterhin updates für Euch haben. Das Betriebssystem ist bereits vollständig einsatzbereit. Auch alle nötigen Komponenten rund um die Box sind in den Startlöchern. Das zurück kopieren der vielen tausend Dateien dauert deutlich länger als anfangs erwartet. Die wiedereröffnung der BlackICE BBS ist jetzt zwischen 8 bis 14 Uhr angesetzt. Die BlackICE BBS ist wieder online. In ca. 9 Stunden wurde eine defekte Festplatte ersetzt und das ganze System wiederhergestellt. Zwei Stunden vor dem angekündigten Zeitfenster hieß es auf Twitter das die Box bereit und hungrig auf anrufe ist. Es besteht weiterhin ein Fehler beim sortieren von Nachrichten. Es werden semaphore Dateien geschrieben ohne, dass die entsprechenden Trigger dafür ausgelöst werden. Das verhindert derzeit noch das vollautomatische sortieren von Nachrichten. Point und Nodes die mit Area/FileFix befehle ausführen wollen müssen unter Umständen mehrere Stunden auf Antwort warten. Der Podfetcher, welcher die Podcast zum download innerhalb der BlackICE BBS bereit stellt updated ca. 7 Monate nach. Dadurch kann die Leitungsgeschwindigkeit beeinträchtigt werden. Und so landet eine weitere Festplatte auf dem Hardware Graveyard der BlackICE. Auf Twitter erhielt der SysOp der ICE unterstützung durch Favs oder Nachrichten. Es wurde eine neue Kategorie eröffnet auf bbsindex.de. Bisher ist es eine kleine Seite mit BBS bezogener Software. Im Moment gibt es dort Terminal und Point Software. Wir hoffen mit der kleinen Auswahl den Zugang zu Mailboxen zu vereinfachen. Vielleicht sogar, dass jemand ein Point wird. Haben wir wichtige Software vergessen? Dann lass es uns bitte wissen! A new category has opened on bbsindex.de. It's a small page with BBS-Related Downloads. For now, we have Terminal Software and Point Software to offer. We hope this little selection will give an more easy way to access Boards and/or become a Point. Let us know, if you're missing some important software at the tiny downloadsection on the page. I want to believe - If it is just us... seems like an awful waste of space. The BlackICE BBS starts the search for extraterrestrial intelligence with the Seti@Home project. What is SETI? and SETI@HOME? The search for extraterrestrial intelligence (SETI) is a collective term for the scientific search for intelligent extraterrestrial life. For example, monitoring electromagnetic radiation for signs of transmissions from civilizations on other worlds. SETI at home is an Internet-based public volunteer computing project. Hosted by the Space Sciences Laboratory, at the University of California, Berkeley - USA. Its purpose is to analyze radio signals, searching for signs of extraterrestrial intelligence capture by the Arecibo radio telescope. Observational data are recorded on 2-terabyte SATA hard disk drives at the Arecibo Observatory in Puerto Rico, each holding about 2.5 days of observations, which are then sent to Berkeley. 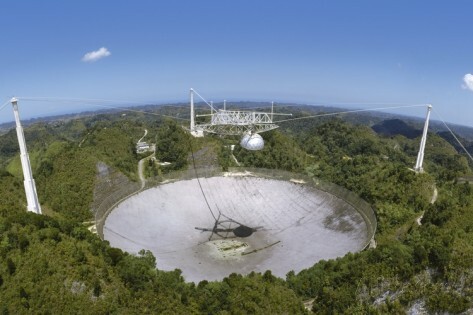 Arecibo does not have a broadband Internet connection, so data must go by postal mail to Berkeley. Once there, it is divided in both time and frequency domains work units of 107 seconds of data, or approximately 0.35 megabytes (350 kilobytes or 350,000 bytes), which overlap in time but not in frequency. These work units are then sent from the SETI@home server over the Internet to personal computers around the world to analyze. And the BlackICE BBS spends now a part of its CPU time to the Seti@Home Project. The installed Software, called BOINC can be scaled in many ways. The Board or other processes running on that machine are not affected with the higher CPU load. Of course, you can watch the status in the BlackICE BBS itself. You will find a new entry under the SysInfo-Menue! 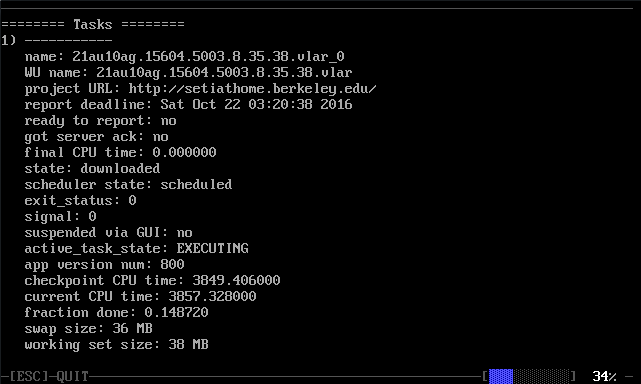 If you're a SySoP and like also to show your running tasks with boinc, use the 'boinccmd --get_tasks' command to print out the status. You'll find the boinccmd executive file in your Boinc install directory. Running Windows? Try 'boinccmd --get_tasks >tasks.txt'. That will create a file named tasks.txt with all Boinc taskinfos in it. Every BBS has its own history. Some have a story that start with "long time ago..." other boards are telling a more shortly one. The Journey of the Shadowscope BBS start in the early 90s. Today the Board is running Mystic BBS on 20 nodes. The Sysop of the Shadowscope BBS, Richard Miles was so kind to share the history of his board with bbsindex.de. Shadowscope BBS began in 1991 as Shadowland BBS. 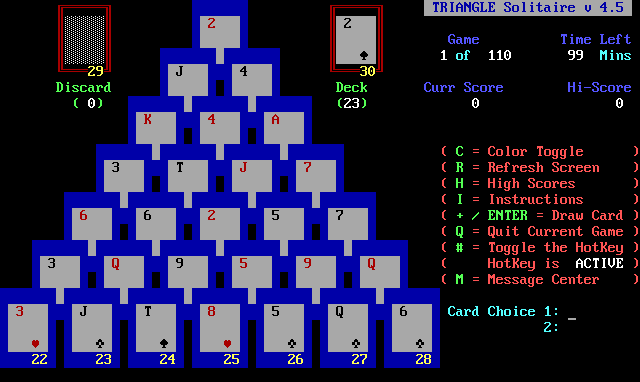 Originally it was run on a Tandy Personal Computer using TriBBS software. After a couple of months I switched to Renegade. Being located in West GA everwhere except the immediate area was long distance including Atlanta, even though it was the same area code. After a few months of that I switched to the “Atlanta Line” which allowed me to dial into numbers in the metro Atlanta area and have them dial in to my BBS. At that time the board was only online at night. My handle online was Deathknight, except of course I used ansi codes to change the “t’s” to crosses lol. Shortly thereafter I added multi-ring support to my phone line. Don’t remember what it was called but you got a different number for each person in the house. I also had a small piece of equipment that would distinguish between the rings and route incoming BBS calls to the computer, which allowed for 24/7 uptime. I also had to get a new computer as my brother had left the military and needed his back. For a brief while one of my users had let me borrow an extra desktop until I could get a PC. I finally ended up renting one from one of those pay by the week furniture places. I also joined Fidonet at that time. My original Fido node number was 1:133/3. It changed to 1:133/1003 about a year later after a new NC took over. Around ’92 a friend and I set up our own FTN network, WeirdNet. At it’s heyday I think we had about 25 nodes. I also joined a few other networks as well including RGNet and a few I can’t remember now. I was very much into modding Renegade at that time, frequenting Digital Playground (Cott Lang’s BBS) and a few other “l33t” boards in order to get ideas. I hex edited RG to change the hardcoded prompts and added in animated ansi in their places. I even had a few mods out on the net that I can no longer find. Around ’95 or ’96 changed jobs and actually started making a little money. also changed BBS software. I started using Intermail as my front end and Proboard for the BBS. I also started getting involved in a couple of other international and national networks, which unfortunately due to my being irresponsible also jacked up my phone bill to a very large amount and the wife, rightly so, made me take it down. I did end up keeping the board up but was no longer involved in anything except local stuff. As things go I ended up taking my BBS down in 98. I pre-registered for the forthcoming version of Proboard (both the DOS and Win32 versions.) Proboard was then sold to Pat Clawson of Telegrafix who ran it into the ground and basically never honored the money we had spent. I also had a new job at that point and didn’t have much time for BBSing. I moved in 1999 to a new area and along with that came BROADBAND. I upgraded my new PC to Windows 2000 and relaunched the BBS as Shadowscope, running EleBBS as telnet only. My handle also slightly changed to dethnite. I used IRC a lot at that point and Deathknight was just too long so I shortened it. I also launched the Shadowscope web site in November. At that point the address was shadowscope.darktech.org and everything was hand coded. In December I launched my first domain, shadowscope.com, which is still up and running along with a few others that are currently forwarding to Shadowscope. I really wasn’t all that interested in BBSing and just had it up for nostalgia at that point so it was only online for about nine months. From 2000 to 2012 I mainly blogged on Shadowscope. Originally the site was run on Movabletype and then around 2009 I moved to WordPress which is what I am running now. I blog about whatever currently interests me. For a few years it was all about crime and around 2010 I pretty much stopped that. After my dad died I lost all interest and while I still write a crime post here and there it doesn’t drive me as much as before. I also did quite a bit of Pay-per-post stuff around that time as well. Hell, brought in 10k one year just from sponsored posts. Not enough to make a living but it certainly paid for my toys and a few bills to boot. Anyway, when I stopped blogging about crime I decided the time was right to get back into BBSing. 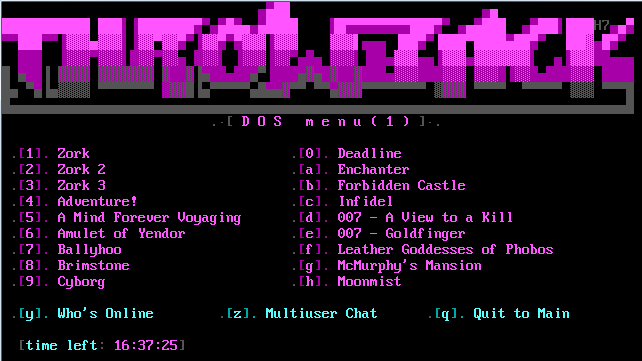 In January 2012 Shadowscope BBS went back online. Originally I was going to go with EleBBS again but as development had stopped I switched over to Synchronet, which I ran until a couple of weeks ago. The old laptop that I hosted on died and I have changed to the current software, Mystic. I am running it on a Windows 10 64-bit machine. I looked into using one of my Raspberry Pi’s but decided I wanted to use them for some IOT stuff which you can read about on my web site. Shadowscope is currently not finished. I am moving over my Ansi menus and still have a lot of back-end work to do. I plan on adding a couple of RSS feeds as well as being able to telnet out to other BBSes and Weather Underground. I will also be tying it into my home automation system using MQTT, I just haven’t decided to what extent. Most likely just pulling information out of the BBS for my use. For this plan, bbsindex.de wishes all the best! During large DDoS attacks, until the DDoS protection is active and has identified and blocked the bad traffic, customers experienced slight or large (depending on the attack) packet loss and we want to ensure that this traffic is not going to affect any services until the protection is filtering actively. Another aspect is that our customers can now benefit from 10 times the speed as before. After the maintenance we will raise the speed limit of all vServers so you can transfer data much faster than before. The website bbsindex.de and the xmpp/jabber server is during the maintenance offline. Back in the 1980s not as many people as today owned a computer. But a few did. And some of them also used modems to call other computersystems. 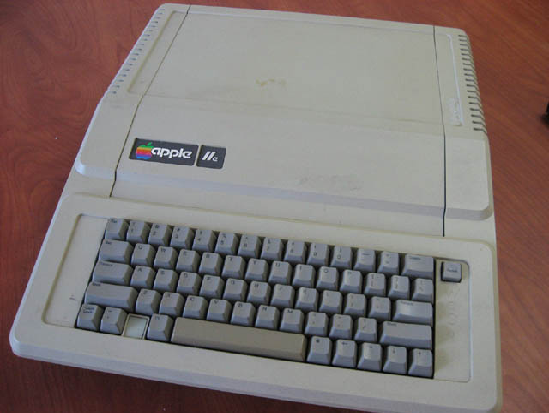 Today, 30 years later, a sysop from the good old times is still active and figured out how you can connect to an Apple //e BBS via the Internet. So, we ran off of Synchronet for a long time, and then switched to Mystic and ran on that for a long time. Recently though, I realized that the tech exists to put an Apple computer, in all of it's 1 mhz CPU, 64k RAM glory, on the Internet. That still doesn't make an old-style BBS work though, because those guys are designed to work purely through modems. But then I learned about TCPser and how it can emulate a modem on one end to allow the BBS to see what it thinks it's supposed to see, and Telnet on the other side so that you can connect to it via the Internet. So, excited, for the past week I've been working on getting an Apple //e based BBS functional and usable from the outside. As of yesterday, I am successful! It's pretty vanilla besides the system info, system news, and menus, but it's up and working. If you want to try out what I think is the only telnet-connectable GBBS (and probably Apple 2 in general) BBS that's running in a fully emulated environment (AppleWin to be specific) I just opened it up to the outside. 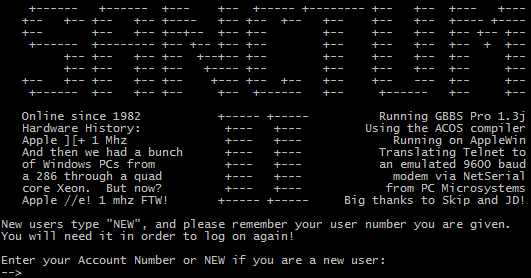 telnet to "sanctumbbs.com" on port "6502" (totally stole that port idea, heh heh) you can give it a try. Nothing special to see, it's just a stock GBBS Pro 1.3j system, but those are pretty uncommon. Besides mine, there are only two others in the world. Anyhow I think that the bare fact that I've got it working at all is truly amazing, I think. Have a look on the board! It's awesome! I explored an old BBS list with all the boards from the past. It's quiet nice. Just grab your terminal and telnet to: sanctumbbs.com:6502. Oldschool software is not easy to set up. A little help might comming from Mystic Guy on YouTube. Behind the name Mystic Guy is the Sysop from the Agency BBS aka Avon. Two Tutorials are online now and more will follow. The first Tutorial explains how to install Mystic BBS and also covers the first steps. The Second one (in two parts) is about Networking. It shows how you connect your BBS to a message network like FSX-NET. Sometimes people say to me: If you see one BBS you know all Boards. If you have a look at the very shiny ansi-board from West Virginia, USA - The Fluph! BBS - the Crazy Paradise BBS from Berlin, Germany running on real Amiga-Hardware or the BlackICE BBS also from Germany - They all have a special focus. The BlackICE BBS is known for the Newscenter. But there is another board now to put in the row with the speical focus BBS. That board had already in the first, early hours a high amount of door-games running. And a bit later, the user was able to play old dos text-games online inside the BBS like ZORK! How cool is that?! But Maskreet, Sysop of the Throwback BBS has a next step in mind: To offer all other Sysops access to a DoorGameServer. With it your users can play about 160 Ansi-Door-Games and DOS-Text-Games at the moment. And all what a Sysop, who like to join has to do is to build a connection to that server. The setup is very easy and will be done with plink and telnetdoor.exe. How can your system be part of this party? 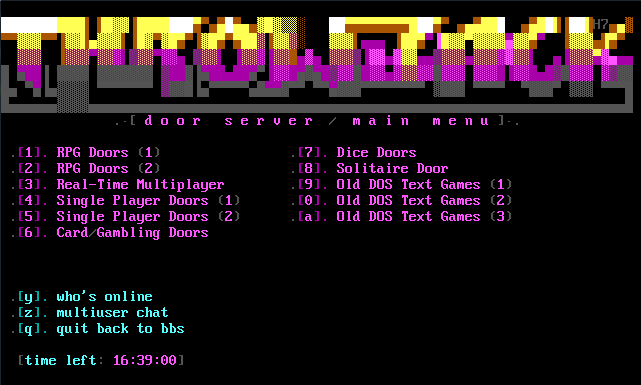 The DoorParty Server has its own forum on the Web. Register and apply with your BBS-Data and you get an answer with all the instructions you need. If you have any trouble, you can be sure Maskreet and the surrounding community will help you to set up your connection to the DoorParty. Today at the FSXNet (A BBS-Scene Text Message Network) the user g00r00 (known as the coder of Mystic BBS) announced that he has started a Wiki for Mystic BBS. 1. The general public will have read-only access to the Wiki. The exception to this rule will be on the "Mystic BBS List" where I will allow anyone to edit in order to add or remove their BBS info. If people abuse this right and alter other people's information in a malicious way, I will take it away. 2. I will manually create users for people who want the ability to edit the pages. If someone does want access as an editor, I will need a desired user name and a valid e-mail address. If you want to take on the role of the editor, please try to be articulate and create documents that are well structured, and highly readable. things populated and well-structured, I will be manually creating pages and managing page creation at the request of the editors. If anyone has suggestions please feel free to make them!" Technology ages faster than your body cells decay or a new car loses its value. Most people would readily agree to that. At some point, one starts searching in vain for allegedly new spare parts for the loved vehicle, which has already reached its public drinking age. Regularly, the bathroom mirror points out new spots, which haven't looked this old earlier. In the same way, one could almost think that there would be no new publications for old technology either. But insiders in the retro scene know better already. Again and again, and not just from fans, newly created sequels of former favorite games appear, as well as new ideas and software approaches from ambitious breadbox-lovers. The generation C64 turned partly into "generation Golf" or "generation Astra", has grown up and both feet on the ground. As, for example, Lodger from D�sseldorf, Germany, who has written a BBS software for the C64. Since the BBS scene has mostly changed from dialup to telnet connections, a discussion about the C64 and telnet BBSing started on RetroHaCkRrS.com in 2009. Motivated by this fertile online conversation, Lodger wrote the first version of his BBS software on the basis of Contiki OS, aptly named Contiki BBS. Contiki OS is an internet-capable operating system for 8-bit computers. It contains a TCP/IP stack, a telnet server and other features, which provide a perfect framework for a BBS software. Location: Düsseldorf. Food: Tasty. Beer: Chilly. Setting: Top. Interviewee: Lodger. Through the skilled use of investigative journalism and, well... the third drink certainly helped, too, we learn that Contiki BBS will be published under a BSD license and can also be found on GitHub. BBSindex.de: What hardware is required by your Contiki BBS? Lodger: To run Contiki BBS, a normal Commodore 64 home computer with a Commodore 1541/1570/1571 floppy drive and a TFE, RRnet or Lan64 compatible Ethernet interface is sufficient. Of course, Contiki BBS can be used in a VICE emulator, but it is necessary that Ethernet emulation is provided by the emulator. This is not the case with the VICE packages provided by most Linux distributions, so on Linux, the VICE emulator must be compiled manually, which requires the libnet0 and libpcap libraries to be installed. On Windows machines, the WinPCAP libraries must be installed for this purpose. BBSindex.de: Which common BBS features does Contiki BBS currently provide? BBSindex.de: What does your roadmap look like? Which features are planned for the future? Lodger: Officially, there is no feature list, but over time (usually once a year), new features get added. More information is available at commfud.ufud.org, via Twitter (@Wintermute_BBS) and elsewhere. BBSindex.de: Do you have an overview of how many systems are online with your program? Lodger: I know of one guy in New Zealand who has been tinkering with Contiki BBS. But I can't tell you any numbers, because I really don't know. BBSindex.de: Does it make any sense to think about file transfer protocols if the system runs from floppy only? sizes of Amiga or modern PC systems. I'm currently investigating if and how file transfer can be implemented within Contiki OS, but there is no descision pro or contra file transfer yet. BBSindex.de: Did you often hit the old technology's limits with your ideas or implementation? hundreds of blocks on the disk or in RAM. Today's generation of coders using frameworks, libraries and complex object models probably won't believe it, but you can pack quite a lot of stuff into 64KB of RAM. 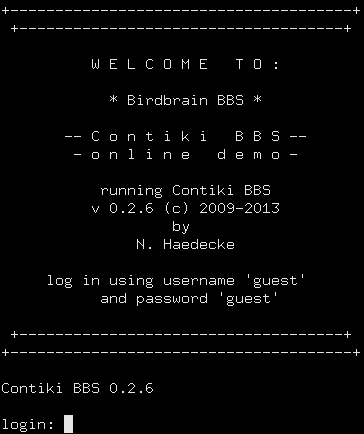 Those looking at Contiki BBS notice soon that it differs clearly from many other BBS solutions, both old and new. In part, this is because no ANSI is shown, but one does not want the typical C64 charm to disappear. Just ASCII! If you want to feel a bit like a breadbox-hacker, you should absolutely take a look at Contiki BBS. Something else, which Lodger consistently avoids to mention is the fact that he is a BBS operator himself. Of course, all new releases of Contiki BBS can be found there as well. Digital accolades have been done in the past. The software is listed in the Commodore Scene Database and was appreciated in issue 90 of the Commodore Free magazine with a short text. Technik altert schneller als der Zellverfall im eigenen Körper vorranschreitet oder ein Neuwagen an Wert verliert. Das kann man so in der Regel unterschreiben. Man sucht sich irgendwann blöde nach vermeintlich neuen Ersatzteilen für das geliebte Vehikel, das inzwischen so alt ist, dass es laut Gesetz rauchen dürfte. Immer wieder entdeckt man Stellen beim morgendlichen Spiegelappell im Badezimmer, die vorher noch nicht so alt aussahen. Da könnte man meinen, dass es für alte Technik auch keine Neuerscheinungen mehr gibt. Das ist für Insider der Retroscene schon längst abgefrühstückt. Denn dort gibt es immer wieder, nicht nur von Fans, neu erstellte Fortsetzungen von damaligen Lieblingspielen, sondern auch ganz neue Ideen und Softwareansätze von ambitionierten Brotkastenliebhabern. Die Generation C64 wurde teilweise zur Generation Golf oder zur Generation Astra, ist inzwischen erwachsen und steht mitten im Leben. So wie Lodger aus Düsseldorf, der eine BBS Software für den C64 geschrieben hat. Da die Mailbox bzw. BBS Scene weitgehend vom klassischen Dialup-Modem via Telefonleitung zur Telnetverbindung des Internets gewechselt hat, wurde im Jahre 2009 auf RetroHaCkRrS.com eine Diskussion zum Thema C64 und Telnet BBSing gestartet. Angeregt von dieser fruchtbaren Onlineunterhaltung schrieb Lodger auf Grundlage von Contiki OS die erste Version seiner Mailbox Software mit dem Namen Contiki BBS. Contiki OS ist ein internetfähiges Betriebssystem für 8 Bit Computer. Es kommt unter anderem mit TCP/IP Schnittstelle, Telnet-Server und anderen Features daher, die ein perfektes Framework für eine BBS Software liefern. Ortstermin, Düsseldorf. Das Essen: Lecker. Das Bier: Perfekte Temperatur. Ambiente: Top. Gesprächspartner: Lodger. Mit geschicktem Investigativ-Journalismus, gut... das dritte Getränk half auch, erfahren wir, dass Contiki BBS unter der BSD Lizenz veröffentlich wird und auch auf GitHub zu finden ist. BBSindex.de: Welche Hardware wird für dein Contiki BBS benötigt? Lodger: Um Contiki BBS zu betreiben reicht ein normaler Commodore 64 Heimcomputer mit Commodore 1541/1570/1571 Diskettenlaufwerk und einer TFE, RRnet oder Lan64 kompatiblen Ethernetschnittstelle. Selbsverständlich kann man Contiki BBS auch mit einem VICE Emulator betreiben, wichtig ist hier, dass der Emulator auch die Ethernet Emulation beherrscht. Die ist bei den von den meisten Linux Distributionen bereitgstellten VICE Paketen leider nicht der Fall, daher muss unter Linux der VICE Emulator ofmals von Hand kompiliert werden, dafür müssen auf dem Linux System die libnet0 und libpacp Bibliotheken installiert sein. Für Windows Rechner gibt es analog dazu die WinPCAP Bibliotheken, welche installiert sein müssen. BBSindex.de: Welche Mailbox-typischen Features bietet Contiki BBS derzeit? BBSindex.de: Und was gibt deine Roadmap vor? Welche Funktionen sind für die Zukunft dort geplant? Lodger: Offiziell gibt es keine Feature Liste, aber mit der Zeit (meistens im Jahresturnus) werden immer wieder neue Features hinzugefügt. Entsprechende Infos finden sich u.a. auf commfud.ufud.org oder via Twitter @Wintermute_BBS. BBSindex.de: Hast du eine kleine Übersicht darüber, wie viele Systeme mit deinem Programm derzeit online sind? Lodger: Ich weis, das es einen User aus Neuseeland gibt, der sich mit Contiki BBS beschäftigt. Aber ob und wieviele Installationen tatsächlich genutzt werden, entzieht sich meiner Kenntnis. BBSindex.de: Macht es überhaupt Sinn über Dateitransferprotokolle nachzudenken, wenn das System von Diskette läuft? Lodger: Grundsätzlich macht das sicher Sinn, denn die klassischen C64 BBS Programme haben dies ja auch angeboten. Dazu braucht man eigentlich nur eine zweite Floppy für die Daten. Zumal die Datenmengen beim C64 ja in einer ganz anderen Grössenordnung spielen als z.B. bei einem Amiga oder PC. Inwiefern sich dies mit Contiki OS realisieren lässt, prüfe ich im Moment. Ob daraus aber dann eine Filebase erwächst, lasse ich hier erstmal offen. BBSindex.de: Bist du bei deinen Ideen oder deiner Umsetzung oft an die Grenzen der alten Technik gestossen? vorstellen, aber in 64KB RAM bekommt man schon ordentlich was unter. Lodger: Weil es soetwas bisher noch nicht gab, das eine BBS für den C64 gleich einen nativen IP Stack mitbringt und somit out-of-the-box einen Telnet Dienst bereitstellt. Zudem wollte ich wissen, ob und in welchem Umfang ich so etwas wie Contiki BBS auf die Beine stellen kann und dabei konnte ich auch gleich Contiki OS etwas besser kennen lernen. Wer sich Contiki BBS anschaut stellt schnell fest, dass es sich von den vielen anderen alten und auch noch heute aktuellen Softwarelösungen zum Thema BBS deutlich abhebt. Das liegt zum einen daran, dass kein ANSI angezeigt wird und zum anderen daran, dass man auch garnicht will, dass der typische C64 Charm verschwindet. Einfach ASCII! Wer sich heute mal ein bisschen wie ein Brotkastenhacker fühlen mag, sollte sich Contiki BBS unbedingt anschauen. Was Lodger die ganze Zeit vermeidet zu erzählen ist, dass er selbst Sysop einer Mailbox ist. Und in dieser finden sich natürlich auch die aktuellen Versionen von Contiki BBS. Digitale Ritterschläge gab es für die Software in der Vergangenheit schon. Unter anderem wird die Software in der Commodore Scene Database gelistet und wurde sogar in Ausgabe 90 des Commodore Free Magazin im Jahre 2015 mit einem kurzen Text gewürdigt. Eine Anleitung zu Contiki BBS hat Lodger im übrigen ebenfalls auf GitHub eingestellt. On February 9, 2016 the Mystic BBS Software Version 1.12 Alpha 1 was released. The Last Final Version 1.11 with some new Features and many Bug-Fixes was released on November 6, 2015. Also a new version (2.0 Beta 17) of Netrunner shows up. Netrunner is a Terminal for best BBS emulation with modern operation systems. Mystic BBS Software is available for Linux, Windows and Mac. Netrunner works well with Linux 32/64Bit and Windows. The Agency BBS located in New Zealand is starting a new Message-Network called FSXNet. fsxNet is not a perscriptive network. e[X]perimentation is at heart of its name and members are actively encouraged to be creative in their use of the network. Only a handfull of message areas and file bases are used - setup is quick and [S]imple. Do you find it [F]un to learn about and use retro computing technologies? Develop and encourage international communications between 20 (or more) geographically diverse bulletin board systems. Support and create learning and experimental opportunities between members. Explore and develop new and interesting methods of online communication between members. Have fun, be respectful and helpful to each other. If you like to join call the Agency BBS via Telnet: agency.bbs.geek.nz and download the info-pack there. Or use the Web: http://bbs.geek.nz/fsxnet.zip to grab the NfoPack. Darkrealms is currently experiencing a rare technical difficulty with providing access to certain Usenet groups in Fido *.PKT format. The problem is at the provider level; in fact it appears to be an issue that may be affecting several Usenet/NNTP providers. or BBS software. At this time, it is somewhat difficult to track the origin of these message "dumps". When Darkrealms downloads messages in those affected groups, the message last-read count jumps to hundreds, sometimes millions of messages. Several times I have had to intervene to stop the mass-downloading, but most times it has already been too late; a few gigabytes of mail has already been processed by the system and sent out to some downlinks. If you are Areafixing Usenet groups from Darkrealms and receive a message that the request cannot be honoured due to security violation; it is likely I have temporarily ceased access to those affected areas. I trust that this setback is temporary; please stay tuned for updates. Vor ca. 15 Minuten ging in der BlackICE BBS eine Nachricht ein, dass die Fido-Node 2:240/1120 (Ambrosia) zwar erreichbar ist, jedoch keine Nachrichten mehr verteilt. Auch eine Anfrage an den AreaFix wurde nicht beantwortet. Sowohl der meldende Point als auch die BlackICE BBS selbst konnten heute (01.02.2016) keinen Nachrichteneingang von der Ambrosia feststellen. In diesen Minuten ist der Sysop der 2:240/1120 dabei den Fehler zu beheben. Die Ambrosia ist für viele Mailboxen in Deutschland das Fido-Tor zu Welt. Nicht nur die Wintermute und die BlackICE BBS beziehen dort das FIDO-NET. Auch die Wintermute BBS (2:240/8002) hat am 30.01.2016 die letzte Nachricht erhalten. Jeder Sysop oder User kennt das Problem: Das System haengt, es dringen obskure Geraeusche aus dem Gehaeuse. Festplattenschaden. Viele User kennen das Problem: Man wird ploetzlich dazu aufgefordert sich in seiner Stammbox erneut zu registrieren. Frueher hatten Mailboxen, die etwas auf sich hielten, Bandlaufwerke in die Rechner geschraubt. 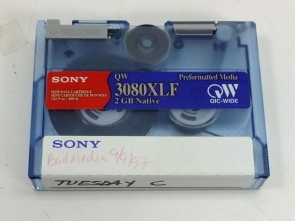 So ein Streamer hat dann schon mal mit QIC80 Baendern irgendwo zwischen 80 und 500 MegaByte Backupspeicherplatz. Datenraten von satten 62.5 KB/s, das dezente Kreischen beim Spulen, das Fiepen beim Lesen und Schreiben oder die Unfaehigkeit Daten on the fly wie ein logisches Laufwerk zu behandeln, machten solche Bandlaufwerke nicht zu jedermanns Liebling. Die Baender waren jedoch bezahlbarer als Festplatten. Heute ist die Datenrate von 62.5 KB/s so unfassbar aus der Mode, dass selbst jedes Smartphone, das 5 Jahre alt ist, schnellere Datenraten beim Internetzugriff erreicht. Festplatten sind zum bezahlbarem Verbrauchsmaterial geworden und schaufeln sich den Null-Eins-Brei mit bis zu theoretischen 6 GB/s rein. Und anstatt Bandlaufwerke (die es NIE in der identischen Farbe wie das Computergehaeuse gab!) in die Computer zu schrauben, stellt der moderne HumanusDigitalus weitere kleine Kisten auf. Die kleinen Gehaeuse in denen Festplatten in verschiedenen Mengen eingeschoben werden sind pure Datenknechte und werden meist in das Heimnetzwerk integriert. Diese NAS (Network Attached Storage) oder auch DAS (Direct Attached Storage) gibt es von vielen Herstellern. Unterschiedlichste Konfigurationsmodi gibt es hier. Vom Rennpferdspeicher bis zum Dagobert-like-Dataspeicher bis hin zum Ausfallsicheren Datengau ist alles moeglich. Betreiber von Systemen auf denen sich Daten befinden, die nach Moeglichkeit nicht im digitalen Nirgendwo verschwinden sollten, waehlen eine Option mit hoher Datensicherheit. Bei all diesen Modi lautet die Antwort fast immer RAID. 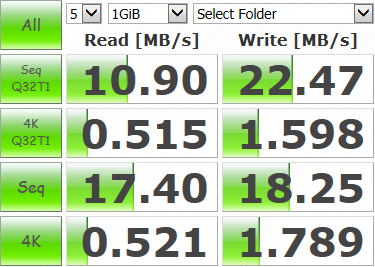 RAID (Redundant Array of Independent Disks) wird heute meist im Modus 0 - Stripping: Beschleunigung ohne Redundanz oder Modus 1 - Mirroring: Spiegelung der Festplatten verwendet. RAID 0 geht hier voll auf Speed und wenn eine Festplatten das Zeitliche segnet, tja dann sind die Daten halt weg. RAID 1 hingegen erlaubt das Sterben von einer Festplatte ohne Datenverlust. Das funktioniert selbstverstaendlich nur wenn man sich 2 Festplatten einschraubt und dabei eine vollstaendige Kapazitaet verliert. Baut man 2x 1000 GB Festplatten in ein RAID 1 bleiben am Ende auch nur 1000 GB ueber, die man nutzen kann. Dafuer darf dann eine Festplatte kaputt gehen. Klingt ja SUPER! Ja... Genau! Das Einrichten von RAIDs und das Erweitern ist einfach nur nervig, also ist das Supergefuehl gleich wieder dahin. Oder um so groesser wenn man es dann geschafft hat... Tools von QNAP, Buffalo, Synology und Co. bieten dank mehr oder weniger durchgestylten Oberflaechen die Einrichtung von RAID ohne dass der Nutzer zwingend weiss, dass es ein RAID ist. 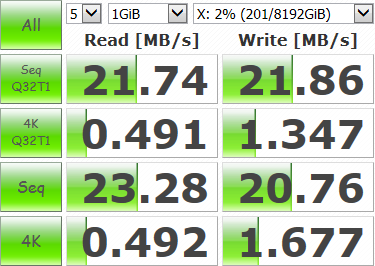 Angenommen jetzt habe ich eben diese 2x 1TB als RAID 1 in meinem irgendwie Attached Storage und brauche mehr Platz! Jetzt faengt der Affenzirkus an. Ich muss die Daten, welche sich auf dem Raid befinden, auslagern. Denn um ein klassisches RAID zu aendern muss es vollstaendig neu aufgesetzt werden. Einfach so eine der beiden Platten anklemmen und Zugriff auf die Daten haben: laeuft in der Regel nicht. Also zwischenspeichern, dann die Festplatten aus dem iAS raus und neue groessere rein. Dann wieder einen RAIDverbund erstellen und Daten zurueckkopieren. Persoenlich habe ich mit der BlackICE BBS schon immer eine gemischte Backupstrategie verfolgt. Jeden Tag werden die Nachrichtendaten und die Userdaten inklusive des kompletten Mailboxsystem gesichert. Das war mal ein 64GB USB-Stick (der auch ganze 10 Monate durchgehalten hat und jetzt nur noch lesbar ist - da die Flashspeicherzellen nicht unendlich beschreibbar sind) und jetzt werden diese Daten auf REV-Disk gesichert. Doch was ist mit den Daten die in den Dateibereichen liegen? Da sind alte Dos Programme und noch ganz anderer Kram aus der Software-Museums-Schublade der gesichert werden will. Anfangs gab es immer intern im Rechner jeder Woche eine Spiegelung der Festplatte. So war fuer einen Ausfall alles im Lot. Irgendwann wurde der Speicherplatz aber so knapp, dass dies nicht mehr ging. Und jetzt liegt es in der Hand des Seagate-Gottes, dass die Platte durchhaelt. Aeh... nun, das kann es auf Dauer aber auch nicht sein. Diesen RAID-Wahnsinn will ich nicht auch noch privat an der Backe haben! Also was tun? Die Loesung waere ein NAS oder DAS welches ein paar Platten im Griff hat und wenn eine kaputt geht ist das einfach mal egal. Die Daten sind weiterhin durchgehend verfuegbar. Die defekte Platte wird einfach im laufenden Betrieb rausgezogen und durch eine neue ersetzt. Hotswapping schimpft sich sowas. Dann will ich aber NICHTS weiter machen muessen. Geht mit RAID nicht. Da darf ich erstmal froehlich Admin spielen. Am besten muss es auch noch eine baugleiche Festplatte sein, mit gleicher Groesse. Oder halt eben groesser, die ich aber dann eh nicht nutzen kann. Weil?! Nun, wenn zwei Festplatten mit unterschiedlichen Groessen in einen RAID-Verbund genutzt werden, endet die maximale Kapazitaet des Verbunds bei der Kapazitaet der kleinsten Festplatte. Das will ich aber auch nicht haben. Wenn meine User wieder in Upload-Laune sind und wieder jeden Tag 4-6 GB in die BBS druecken, wuerde ich gerne einfach so groessere Platten ins iAS stecken und hab einfach mehr Speicherplatz. Das laeuft halt mal garnicht mit RAID 1. Im Jahr 2007 fiel von San Jose in Californien aus ein kleiner, schoener, schwarzer Kasten auf den IT-Markt, der mit einer RAIDschen Wunderwaffe ausgestattet war. Beyond Raid ist eine Technologie die ausschliesslich in DROBO-Produkten zum Einsatz kommt. Das ist so flexibel, dass sich RAID schaemen muss. Ich habe ein 4Bay System (fuer 4 Festplatten) und schiebe 2 SATA Platten rein. 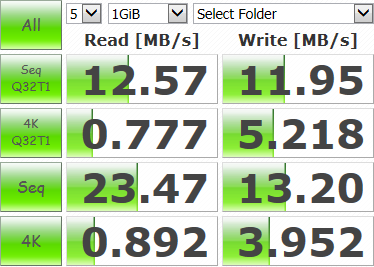 Erstelle mit dem Drobo Dashboard innerhalb unter 5 Minuten ein Laufwerk. Dabei wird eine virtuelle Groesse gewaehlt. Weshalb virtuell? 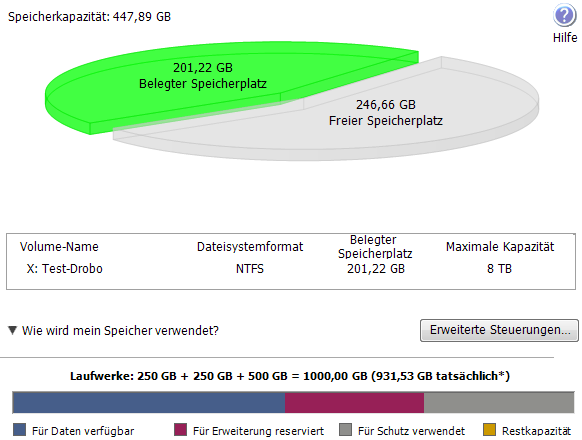 Angenommen es sind 4x 250 GB Festplatten im Drobo, dadurch kommt eine nutzbare Kapazitaet von ca. 750 GB zustande. Werden dann eine oder mehrere Festplatten gegen Groessere ausgetauscht, wuerde auch das Laufwerk groesser werden, wenn Drobo die tatsaeliche Groesse mitteilen wuerde. 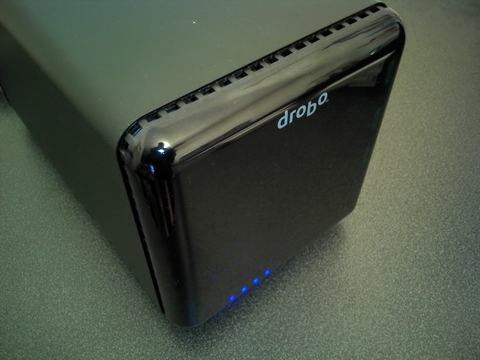 Also macht der Drobo dem Betriebssystem vor, es handelt sich um ein z.B. 16 TB grosses Laufwerk. Obwohl nur ca. 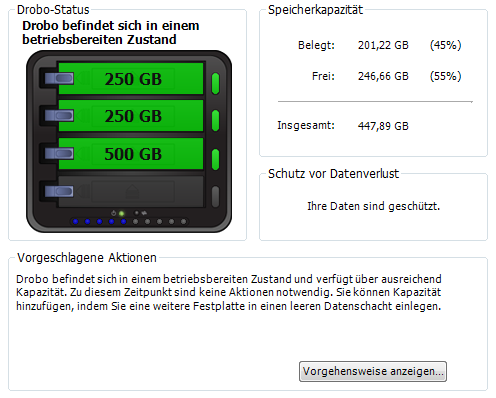 750 GB nutzbar sind. Wird eine der kleinen Festplatten spaeter ersetzt, waechst der Speicherplatz, der zur Verfuegung steht. Das virtuelle Laufwerk welches vom Betriebssystem angesteuert wird, veraendert sich hingegen nicht. So sind Kapazitaetsaufstockungen ohne neues Mounten des Laufwerks moeglich. Befinden sich Daten auf dem Drobo und man greift gerade auf diese zu und zieht eine der Festplatten aus dem Geraet passiert quasi nichts. Der Drobo blinkt und verlangt eine neue Festplatte. Die Software, welche fuer Windows und MAC offiziell mitgeliefert wird (fuer Linux gibt es eine community-software), weist darauf hin, dass eine Festplatte fehlt oder defekt ist. Es kann jetzt jede nur erdenkliche Ersatz-Festplatte eingeschoben werden. Hersteller: Egal. Festplattenkapazitaet: Egal. Sie sollte einfach 3.5" und SATA sein. An diesem Punkt macht der DatenROBOter das, wovor viele Angst haben. Er ersetzt den Admin :) Die Neukonfiguration mit der getauschten Festplatte wird vollstaendig automatisch gemacht. Die Datensicherheit wird wieder hergestellt. Nach einiger Zeit darf wieder eine Festplatte ausfallen. Waehrend dieser ganzen Aktion ist ein permanenter Datenfluss moeglich. Keine Datei geht verloren, kein Datenstream reisst ab. Der Drobo bietet Datensicherheit beim Ausfall einer Festplatte im System. Auf Wunsch kann diese Sicherheit auch auf zwei Festplatten angehoben werden. Administrativer Aufwand dafuer: Ein Klick. Das Drobo-Dashboard meldet den verfuegbaren tatsaechlichen Speicherplatz auf dem Geraet als Systemicon. Der Drobo hat 10 LEDs an der Front. Jede LED steht fuer 10% der genutzten vorhandenen Kapazitaet. So leuchtet ein halb voller Drobo mit 5 LEDs vor sich hin. Ist die Kapazitaet nahezu erschoepft, sinkt die Schreibdatenrate und der Drobo meldet sich via Software und Status-LED am Geraet. Und jetzt? Nun, ganz einfach. Die kleinste Festplatte rausziehen und gegen eine Groessere tauschen. Sofort erhoeht sich der verfuegbare Speicherplatz und die Schreibgeschwindigkeit steigt wieder aufs Maximum. Jetzt arbeitet der Drobo eine Zeit lang um die Datensicherheit wieder herzustellen. In der Zwischenzeit sind jedoch - wie gewohnt - alle Daten verfuegbar. Bevor der Drobo permanent fuer die BlackICE BBS zum Einsatz kam, wurde das Geraet durchgetestet. Jede beschriebene Situation wurde nachgestellt. Einige davon sind auch im Video zu sehen. Inzwischen ist die Drobofamilie gewachsen und bietet neben Home-Storage auch Office-Loesungen an. 19" iSCSI 12 Bays oder fuer unterwegs den DroboMini fuer bis zu 4x 2.5" HDDs. Der User SimSim hat sein altes Drobo-System der 2. Generation inkl. DroboShare der BlackICE BBS zur Verfuegung gestellt. Vielen Dank an dieser Stelle nochmal! After 21 years John Romero, co-founder of ID-Software and co-coder on the most famous shooter game ever DOOM, returns back to his job as mapper and creates a new level for Doom. it's a while ago that John Romero build a map for doom. 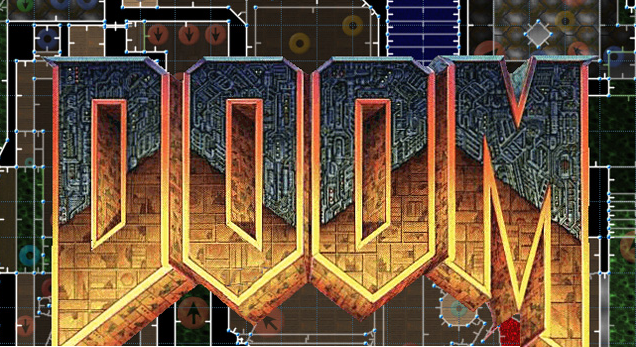 The last mapping action was in 1995 for "Ultimate Doom" (e4m2, e4m6). In the e1m8b.txt file which is also included in the e1m8b.zip archive with the level itself, he called it a "warm-up". is there more cool new mapping-stuff coming? wanna know the plot? here it comes! After exiting the Computer Station you knew the worst was up ahead. You still hadn't reached the place where the demons were coming from. The steel door shuts behind you as you realize you're there; you're at the Phobos Anomaly. Cracks from hell are all over the place as seepage from the portal invades the entire installation. format (BBS, Diskette, CD, etc)..."
And OF COURSE we do it in old school style and so you can download the E1M8B.ZIP in DOS - GAMEZ filearea of the BlackICE BBS! Die Dateisuche von BBSindex.de wurde um die Mailbox Wintermute aus Duesseldorf erweitert. Ab jetzt koennen alle Dateien der Syncronet BBS im Web online durchsucht werden auf BBSindex.de. The filesearch database on BBSindex.de has been upgraded. Die BlackICE BBS hat die Jahresstatistik fuer 2015 veroeffentlicht. Demnach kam die Box auf 4203 logins im Jahr. Der staerkste Monat war der Maerz mit 433 calls. Der September hingegen verzeichnet das Jahrestief mit 207 anrufen. Das Newscenter, die Nachrichten-Zentrale der ICE wurde 1360 mal von den Benutzern besucht. 852 mal griffen die User zur DoorGameArea mit klassischen Ansi und Text Mailboxspielen. Spannend ist die Auslastung pro Stunde die dieses Jahr erstmal veroeffentlich wurde. Wer es eher ruhig und einsam mag verbindet sich am besten zwischen 2 und 6 Uhr frueh. Wer auf action steht ist gut beraten sich zwischen 20 und 24 Uhr einzuwaehlen. Verglichen mit dem Jahr 2014 verzeichnet die BlackICE BBS in allen bereichen ein defizit. Waren es im Jahr 2014 noch 4713 caller sind es 2015 510 anrufer weniger. Auch das Newscenter und die DoorGames wurden weniger besucht als noch 2014. Das Newscenter erlitt einen schwund von 331 und kommt total damit auf 1360 Aufrufen. Die Lust aufs zocken sank sogar um fast die haelfte. 697 weniger Zugriffe mussten vermeldet werden. Waren es 2014 noch 1549 sind es 2015 nur noch 852. Vielleicht ist es an der Zeit ein paar neue Spiele zu installieren? BBSindex.de: Nach ausfall wieder online! Nach einem rund 11 stuendigen Serverausfall sind die Dienste wieder online. Der XMPP / Jabber Server laeuft seit ca. 16.30 Uhr und die Webseite bbsindex.de wurde gegen 17.00 Uhr hochgefahren. Durch Hardware bedingten Schaden kam es zum crash des Dateisystems. Nach einer wiederherstellung eines Backups von letzter Nacht konnten alle Daten ohne verluste rekonstuiert werden. Fuer alle die an diesem Sonntag via XMPP chatten wollten oder bbsindex.de besuchten wollten entschuldigen wir uns. BBSindex.de wuenscht Euch ein frohes Neues Jahr 2016! Der erster User der 2016 die BlackICE BBS anrief war firefly. Der letzte User von 2015 war DoppelD. 2015 gab es total 4203 logins in die BlackICE BBS. Leider konnte die bisherige Bestmarke von 4713 total calls 2014 nicht geknackt werden. Dank der immer zahlreicher werdenen Stammuserschaft waere das aber fuer 2016 vielleicht moeglich. Vielen Dank vom SysOp der BlackICE BBS fuer die Treue im vergangen Jahr und den Jahren davor. The BlackICE BBS is using Iomega Rev Disk for daily and system backups. 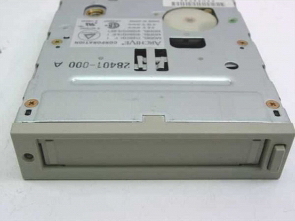 In this video you have a look at the technology of Iomega's Rev Disk Removable Hard Disk Drives. A Amiga 500 Talk will be held today at 18:30 in Hall 6 at the Hackercongress 32C3 in Hamburg, Germany. there's also a kodi (xbmc) addon called ccc-tv whichs offers you to access livestreams and video on demand to the congress and other events. Ein Talk zum Amiga 500 wird auf dem Hackerkongress in Hamburg 32C3 in Halle 6 gehalten. Und es gibt ein kodi (xbmc) addon mit dem namen ccc-tv. dies erlaubt neben livestreaming auch das ansehen von vergangenen events. Der Netco des DoREnet hat vor kurzem den Sysop der BlackICE BBS darueber informiert, dass sein System einen Crash erlitten hat. Aus diesem Grund muessen einige Nodes neu eingerichtet werden. Ebenso sind einige Userdaten verloren gegangen. User der Dreamland BBS sollten sich daher nicht wundern, wenn sie ihren Account erneut anlegen muessen. In der Themenreihe "Behind the Terminal" lassen Sysops sich in die Karten schauen. Was passiert, wenn der User Dieses oder Jenes in der Mailbox ausfuehrt? Woher kommen die Netz-Nachrichten? Warum lieben Sysops FILE_ID.DIZ? Weshalb sind Door-Games eigentlich DOOR-games? Diese und andere Fragen sollen beantwortet werden und verdeutlichen, weshalb der Betrieb einer BBS sogleich faszinierend als auch arbeitsintensiv sein kann. Den ersten Einblick gibt es von der BlackICE BBS zum Thema Modemanbindung. 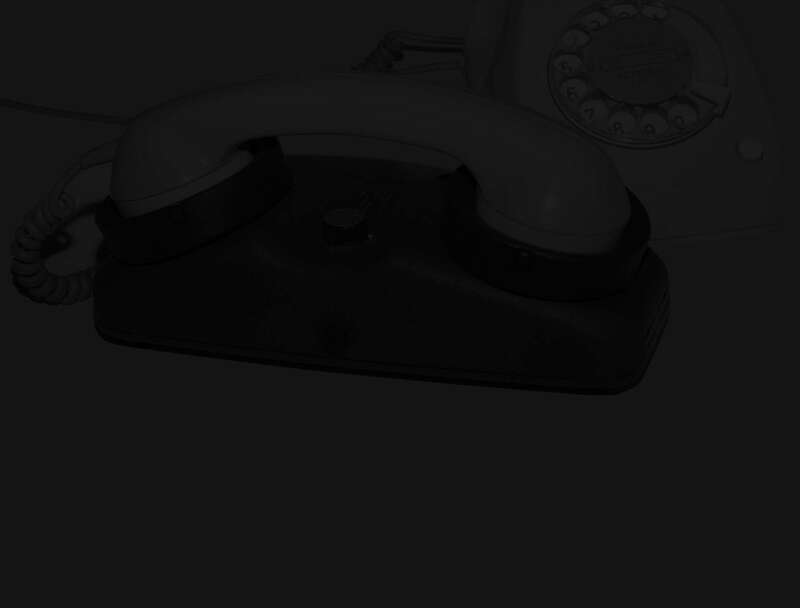 Die Telefongesellschaften stellen die Telefonstruktur innert der naechsten Jahre vollstaendig auf VoIP um. Damit laeuft die Telefonie dann nicht mehr einfach so analog ueber das gute alte Kupferkabel (nun irgendwie schon, aber verpackt in TCP/IP Paketen), sondern wird mit dem Internet digital angeliefert. Yippy! Fortschritt. Hier forken sich dann auch schon die Geister. Fortschritt ist selbstverstaendlich erstmal positiv. Besonders fuer jene Generation, deren Brotkastencomputer jederzeit im Kinderzimmer das Retten der Welt via Joystick moeglich machte. Dennoch birgt die Umstellung der analogen Telefonie auf das digitale VoIP einige Probleme. Modems, die dazu gebaut wurden, digitale Computerdaten in hoerbare Geraeusche umzuwandeln, welche ueber die Telefonleitung zu einem anderen Modem transportiert werden, um dort wieder in digitale Signale umgewandelt zu werden, funktionieren nicht mehr so richtig. Das Modulieren und Demodulieren (MoDem) der Daten von Digital auf Analog und von Analog auf Digital muss synchronisiert werden. Jeder groessere Zeitversatz stoert die Leitungsstabilitaet und vermindert die Datenrate. Versucht man nun diese Geraeusche in TCP/IP Pakete zu verpacken, laufen Modems schnell "Out of Sync" und frueher oder spaeter taucht ein "No Carrier" auf dem Bildschirm auf. Abgesehen davon werden die Sprachsignale bei VoIP auch noch komprimiert mit einem Audiocodec. Rudimentaer ausgedrueckt wird das Gesabbel gezippt ueber die Leitung geschickt. Dabei werden auch fuer das menschliche Ohr nicht hoerbare Frequenzen "wegoptimiert". Das ist fuer so ein Modem auch nix, denn es kann genau diese Frequenzen verarbeiten. Was macht man also, wenn man heute noch einen Modemzugang als Mailbox anbieten will? Und WARUM will man das eigentlich noch? Klaeren wir die letzte Frage zuerst. (Macht mehr Sinn.) Die Antwort ist schlicht und logisch. Wenn das Internet ob lokal, landesweit oder global einmal gestoert ist, gibt es fuer eine Datenverbindung nur noch die Moeglichkeiten (analoges) Modem oder Paketradio (Datenverschieberei mit Funk - Bitte nicht mit WLAN verwechseln). 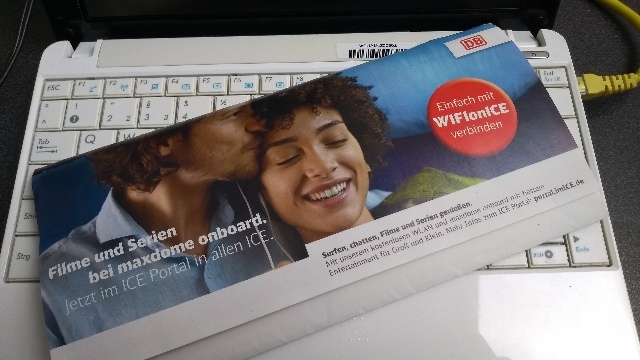 Mit dem Modem habe ich dann immer noch Zugriff auf Nachrichten-Netze und andere Features die eine Mailbox meiner (An)wahl anbietet. Im uebrigen gibt es noch sehr viele Modemverbindungen in der Industrie, die Geraete steuern. Wie kann ein Sysop sein System fuer ein Modem aufbrezeln? Die Hardwarevoraussetzungen sind in Vorfeld zu klaeren. Wer noch einen richtig guten alten Telefonanschluss hat (POTS = Plain Old Telephone System), der darf diesen noch bis 2018 behalten. Und! Mit einem schoenen alten Modem wie dem hier abgebildeten viel geliebten ZyXEL U 1496 E betreiben. Aber eben nur bis 2018. Maximal. Denn der Pinke-Telefon-Panter in Deutschland will bis dahin kein POTS mehr im Netz haben. Die Alternative ist ein GSM-Modem. GSM (Global System for Mobile Communications) steht vereinfacht fuer Digitales Mobiles Telefonieren. Es ist also digital, kann aber analoges Modem? Genau! Und ja, Grossvaterparadoxon. Angeschlossen an der BlackICE BBS ist ein GSM-Modem, das mittels RS232 an den PC angeklemmt ist. Dabei werden keine Kupferkabel gebraucht, die Daten werden ueber das Mobilfunknetz transportiert. Jedes Modem, das an POTS haengt oder VoIP oder GSM kann hiermit verbinden. Bei VoIP mit den ueblichen Nebenwirkungen, obwohl die BlackICE Seite weder TCP/IP noch einen Audio-Codec nutzt, da ein GSM-Modem benutzt wird. Die Datenrate ist auf 9.600 Baud beschraenkt. Dafuer aber stabil. Weitere Alternativen sind Funkverbindungen, wie sie im Paket-Radio (HAM) genutzt werden oder in WLAN-Netzwerken. Diese sind jedoch kaum verbreitet. Die Datenrate im Paket-Radio Bereich liegen meist nicht ueber 2.400 Baud. Jetzt kommt der Anrufer auf dem Serial-Port des BlackICE BBS PC an und dann? Dann braucht man an dieser Stelle einen uebersetzer. Das liegt daran, das vor einigen Jahren die Mailboxsoftwareloesungen auf Telnetzugang umgestellt haben. Einige haben die Moeglichkeit, ein Modem anzusteuern noch implementiert. Andere nicht. Im Beispiel der BlackICE BBS ist dies nicht der Fall. Die eingesetzte Mystic BBS Software kann ein Modem nicht direkt ansteuern. Dazu wird dann eine Software genutzt, die den Modemanruf nach dem Handshake (erfolgreiche Verbindung) auf einen Telnetport schiebt (lokal auf dem Rechner der BlackICE). Die Daten werden mit einer Art Umleitung von Telnet aufs Modem umgelenkt. Dabei wird von diesem Softwaremodul ein Telnetanruf gefaked. Die Software, die zum Einsatz kommt ist SEXPOTS und wird prompt von der Mystic BBS "Konkurrenz" SynchroNet geliefert. (Paradoxon#2). Abschliessend sei noch gesagt, dass viele Handys ein GSM-Modem sein koennen. Es koennte also sein, dass du gerade eines in der Tasche hast! Unter diesem Umstand ist es eher foerderlich als nachteilig, dass die BlackICE BBS ueber eine Mobilfunknummer zu erreichen ist. Da alles geflattet ist in der heutigen Zeit und die Einheit keine 23 Pfennig mehr kostet (Jap, bin alt! - Und du auch, wenn du dich noch erinnern kannst...), sollte auch das kein Problem sein. Erst vor kurzem wechselte die Wintermute BBS von der BBS Software Mystic zurueck zur Syncronet Software. Damit lautet das Motto "Back to the roots" und "Unplug the web now". * Neue Spiel in der Wintermute BBS !! Fuer all' die Zocker unter Euch gibt es jetzt ein paar neue Spiele bei den ex- ternen Programmen (Doors). Neu dabei unter anderem: Lemons (ein Lemmings Clone), Star Trek (ein 2D Shooter), Synkroban (Sokoban) und vieles mehr! Schaut euch in Ruhe um und falls etwas nicht richtig klappen sollte, schreibt mir einfach eine PM. * SSH Zugang nun verfuegbar Ab sofort kann die Wintermute BBS auch per SSH unter TCP Port 2222 erreicht werden. Wer also einen verschluesselten Zugang bevorzugt, der kann diesen nun nutzen. Wir freuen uns auf Euren Besuch! Die Wintermute ist unter telnet://wintermute.bbsindex.com zu erreichen. Die Datenbank der Dateisuche wurde erweitert. Es sind jetzt 15 Mailboxen die nach Dateinamen und Dateibeschreibung durchsucht werden können. Es sind jetzt 472.941 Dateien in der Datenbank eingetragen. Dateien koennen nun weltweit auf bbsindex.de in Mailboxen gesucht werden. Wer eine Datei sucht, die schon einige Jahre aelter ist, kommt frueher oder spaeter auf die Idee das Web zu verlassen und sucht in alten Mailboxsystemen. Jede BBS einzeln anrufen und durchsuchen ist muehsam. Mit der Dateisuche auf bbsindex.de koennen alle Filelisten der teilnehmenden Mailboxen durchsucht werden. Dies bietet die Moeglichkeit gleich mehrer 100.000 Dateien in wenigen Sekunden nach Beschreibung oder Dateiname zu durchsuchen. Ist man fuendig geworden, erhaelt man alle Infos die noetig sind um an die Daten gelangen. So sind neben Beschreibung, Dateiname und Dateigroesse auch das Brett (bzw. die Filearea) im Suchergebnis verzeichnet. Gestartet wird mit 5 Mailboxen und knapp 400.000 Dateien. In Zukunft werden sich auf bbsindex.de Neuigkeiten und Informatives zur Mailbox (BBS) - Scene finden lassen.